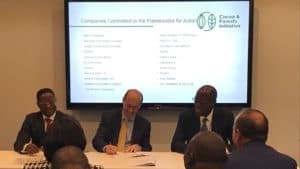 The governments of Ghana and Ivory Coast, along with leading chocolate and cocoa companies, have today announced far-reaching joint Frameworks for Action to end deforestation and restore forest areas in these two top cocoa-producing countries. The governments and companies who have committed to the Frameworks represent an estimated eighty percent of global cocoa usage. The Frameworks were launched in Bonn, Germany, during a side event in the UK Pavilion at the ongoing United Nations Climate Change Conference (COP23). The Frameworks for Action seek to operationalise the cocoa industry’s statement of collective intent to end deforestation and forest degradation in the cocoa supply chain, made in March 2017 as part of the Cocoa and Forests Initiative. They are the products of extensive multistakeholder consultations held with the Ghanaian and Ivorian governments, cocoa and chocolate companies, farmers and farmer organisations, civil society organisations, development partners, and other stakeholders in the cocoa supply chain. Partnerships for Forests, through its West and Central Africa regional office, provided support to IDH to convene the key cocoa stakeholders and lead a process of consultations to develop the Frameworks along with the World Cocoa Foundation and the Prince of Wales International Sustainability Unit.